ASTRO n.z.o. 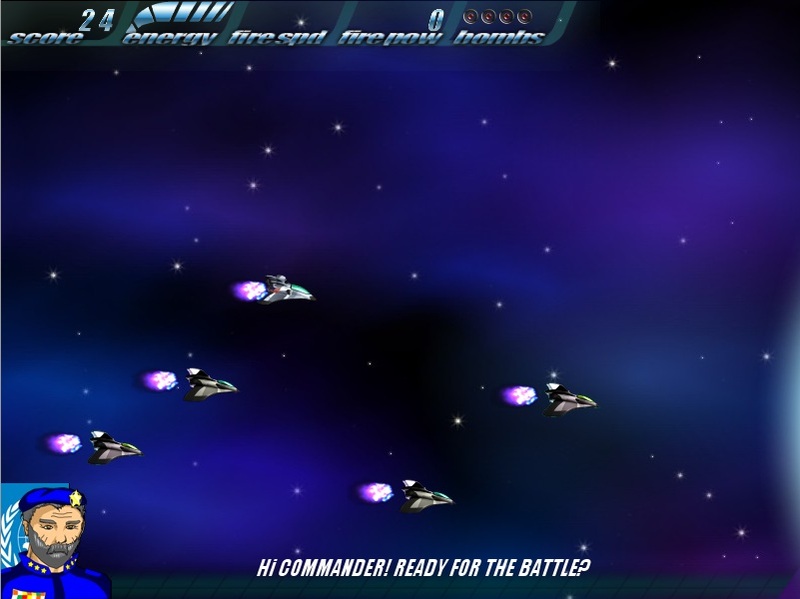 is a survival scrolling space shooter where players become a space commander and fights against the threat of space rocks! 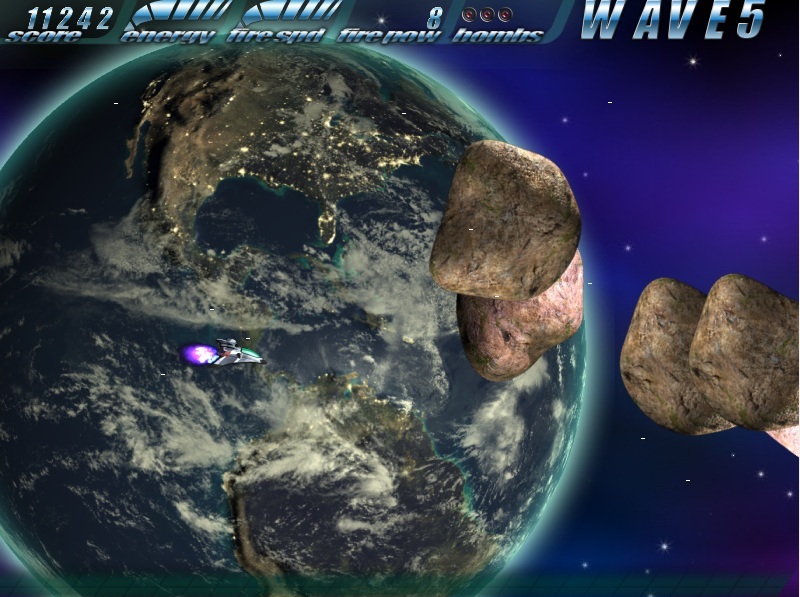 choose up to three kind of space ships and destroy all rocks around you, save the Earth and make the best score! WASD and UP,RIGHT LEFT,DOWN keys for movements,“O”,“C” and left mouse button keys for fire, “P”,“V” and right mouse button for bomb. ESC and Space keys for restart the game. The game is hosted on Kongregate, and freankexpo.net, Opera app store , Clay.io . Edited by goresoft, 14 October 2014 - 10:39 PM. Follow at Twitter @Merlocker_Games Dropbox-Dropbox refer Blog at-Triond GameGraphics-GameGraphics Get a free adF.ly account here! You see the red button? PUSH IT!!!! thanks a lot, if you want you can add a comment on official game site or where you want. I 'm going to lock the game on Cryset.com for updates, so you cannot play it for now on that site. Sorry for the inconvenience. Edited by goresoft, 10 July 2012 - 02:17 PM. The only site I was able to play it on was Kongregate. When I played it using IE9...Sometimes the controls seemed to become unresponsive...I could only move in certain directions...but not others. I didn't have any control issues when I played it with Google Chrome. Note: What code/ format did you use to get the background music to play? Edited by Mornez, 14 July 2012 - 10:10 PM. Hi Mornez and thank you for your test. About IE9 i loaded another version with some bugs resolved. Please retry and let me know if the bug exists again. freankexpo mirror is now ok.
About the music i used mp3 and ogg, i coded with gml a controller that stop and play the music when it is necessary. No gex or things like that. I reached 400 visits on Kongregate, not bad! Edited by goresoft, 17 July 2012 - 01:31 PM. Please, give some help here. Does Kongregate pays for you to host the game? When you upload the HTML5 game you use the iframe option, am I correct? No, kongregate don't pay you directly for hosting your games if your game isn't so interesting, In other cases they could sponsor you. Anyway you can earn from advertisments that appears before your game loading screen. you will earn up to 35% of the click value, but if you include the kongregate apis in your games, the earning quote is 50%. Yes, you have to choose iframe option. Edited by goresoft, 20 July 2012 - 10:31 AM. consider to include your game in a your iframe before the kongregate's one. You will avoid firefox iframe problems. You too can add your games to our arcade, make money each time your game is played in a competitive format, NO ADS. Early adopters are earning as $0.0625+ each time your game is played in a competitive format.